This has just hit my radar, and touches on many points I've made over the years. I don't usually like to point people toward other blogs, I try to provide new content of my own, but this just says a lot of things really well. I've encountered a few of these problem players (particularly in many LARP events). 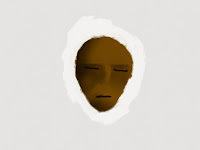 Alright, so we've worked our way through a painting tutorial (almost). 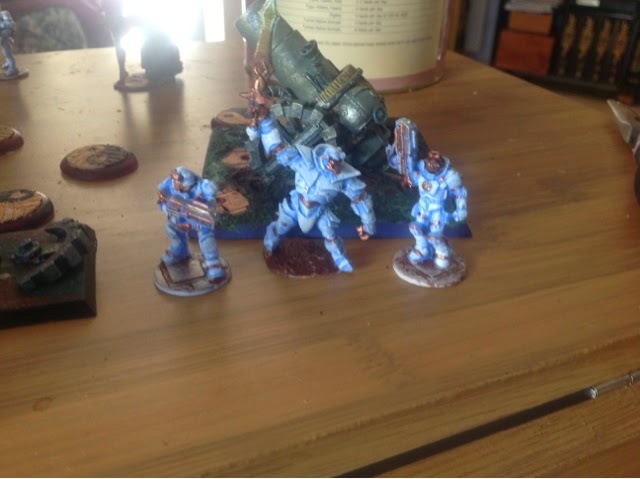 There is a lot more to the hobby of miniature wargaming than simply painting up figures and moving them around a table with the assistance of some rules and dice rolls. One of my favourite aspects of the hobby is developing terrain. 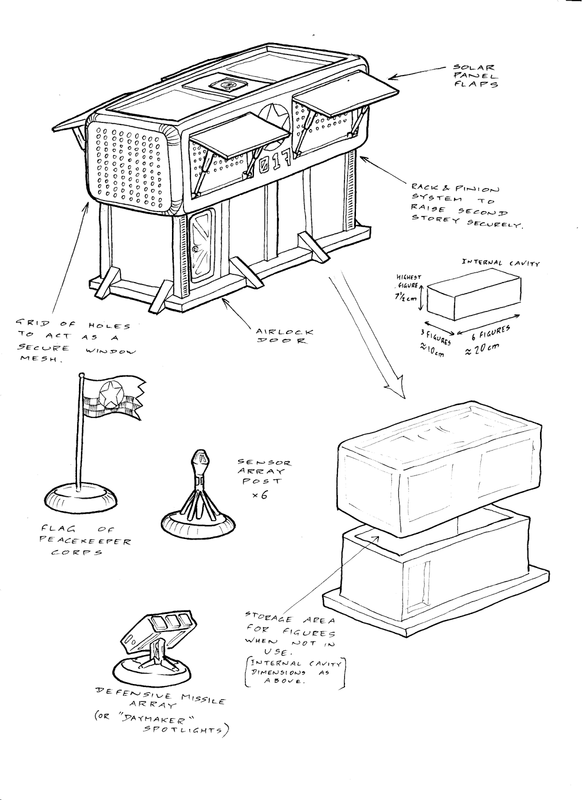 I've had an idea for my peacekeeper force, it's basically a carry case for the unit of troops, and a field base of operations to go on a table. I've started drawing up a few sketches to get my mind heading in the right direction for the project. The piece is based on the concept of the rapid deployment emergency shelter developed by Daiwa. Then I've applied a few retractable solar panels, and it will be painted up in a manner to match the troops in this unit. This tutorial series will go through my development process for the build, and a bit of my theory regarding wargaming terrain. Late in 2013, there was a story about plastic animals doing the rounds. It appeared in a few places, but this seems to be the origin of the story. This story has sat in the back of my mind for a while. It has given me thoughts about finding plastic animals of my own and using them in games. The problem is that most of the plastic animals I've found have been common beasts (or at least common for this part of the world...kangaroos, emus, platypi, etc. and typical zoo animals with distinctive shapes like lions, elephants, camels), certainly nothing monstrous. But the other day I saw some plastic dinosaurs, and since I've been painting up plastic figurines, I figured that they might provide an opportunity. Voidstone Chronicles needs some interesting creatures for its heroes to face, and dinosaurs might make a fascinating addition to the setting. 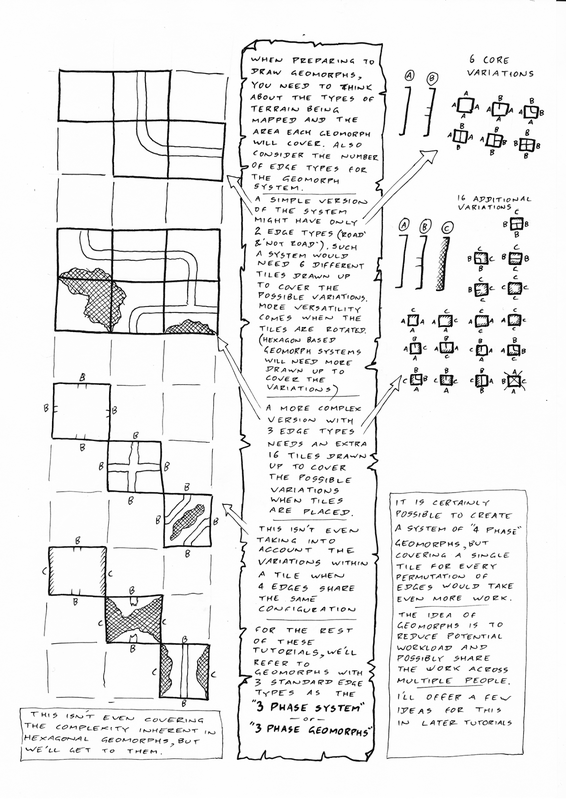 There are many people who draw maps, especially in RPG circles. One of the more prominent figures around is Dyson Logos. 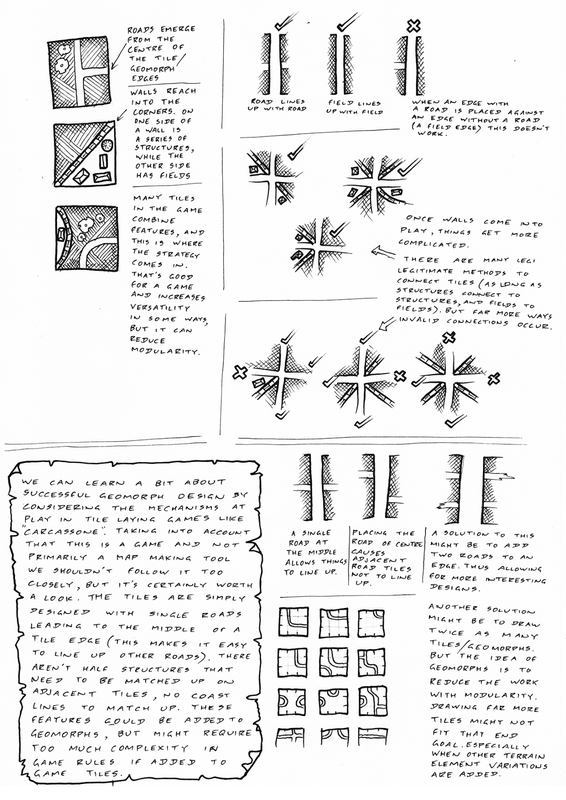 He's just posted some great stuff about cartographic methodology over on his blog. Not a lot of theory today, mostly just an update on where the figures currently stand. 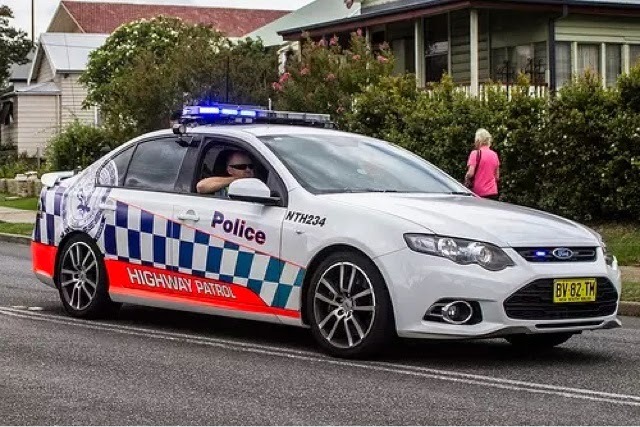 As you can see, I've gone with the local highway patrol car as inspiration for the base with a star indicating the figures forward facing. The stars are done pretty simply, with a dot of bronze coloured metallic paint...then I cheat. I draw the star over the top with a fine marker pen. When preparing a dozen bases in a similar manner, sometimes a shortcut like this makes the process a bit less tedious. 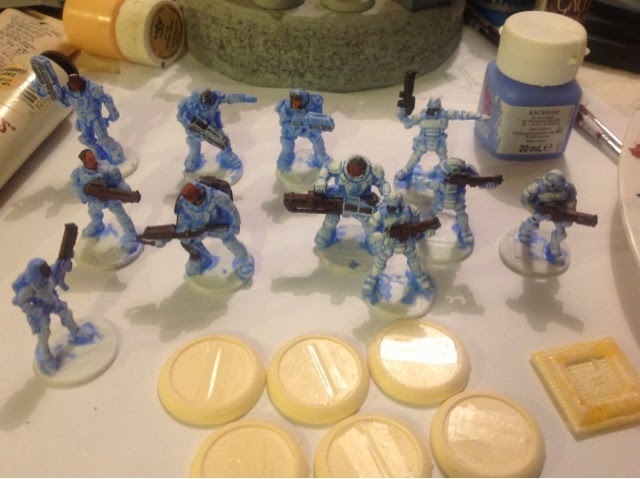 The downside is that you need to spend a bit longer before clear-coating or spray varnishing the marker ink, otherwise it's prone to running. 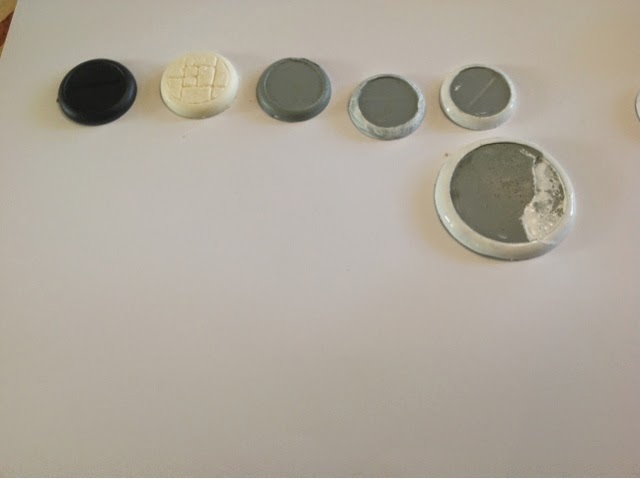 I've come up with some inspiration for my bases, something to make them more distinctive. Since this squad is generally being used as police and peacekeepers, they aren't stealthy in any way. They like to make their presence felt, and if you cross their path, you're probably breaking the law and will feel their wrath. Building up a sequence of blue checkers on the white. Maybe with the bright orange as a name plate for the officer (we'll see about that one). At the 'front' of the base, I'll put a gold star. This will designate the facing for those game systems that require the 'front' of the figure to be indicated. At the back, I'll add the officer's name. Good eyes and faces give a figurine character, they can cover a multitude of sins on the rest of the piece. Good bases ground the figure into their world. 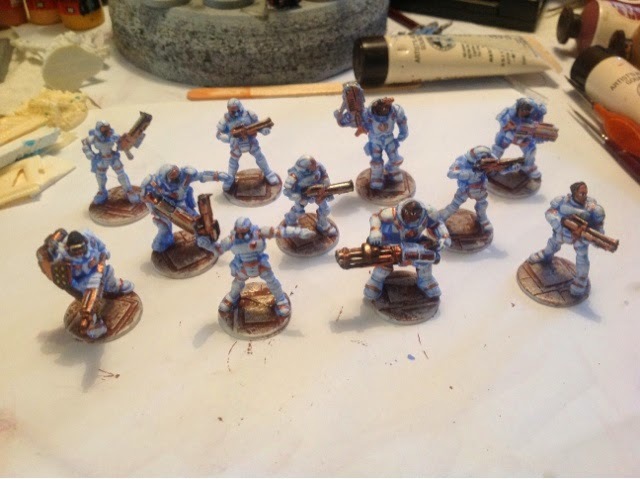 This post covers the preparation work, along with some of my theory about bases. 1. This is a typical 30mm round base, common to many games at the moment (Warmachine and Malifaux are the two I'm most familiar with). 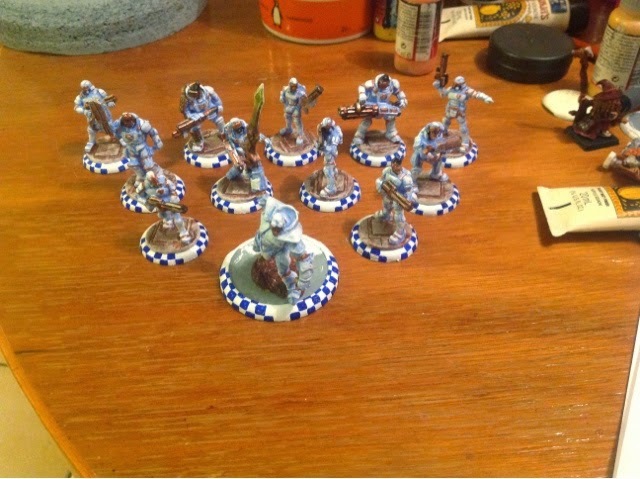 These bases are also an exact match for the Sci-fi Reaper Bones squad I'm painting up. 2. I don't particularly like hollow plastic bases, because I like to drill things into them, and the plastic can be a bit flimsy when figures see regular use. For this reason, I mould up my own bases in resin, or buy custom bases that fit the theme I'm working with. The depicted base here uses a dungeon floor design. There are some great freeform writers in Australia, but generally a writer will consider their work to be a piece of art, something that they like to keep under their control. This is an overgeneralisation, but it might help explain why there is so little information about Australian Freeforms on the internet. The work is often kept close to the writer's chest, and in a little bit of ego sensitivity a lot of writers feel that their work might not be done justice when they aren't present to shepherd the results. It also doesn't help that a lot of freeforms are written with ad hoc notes and marginalia through the text offering suggestions on how the event might be run best. 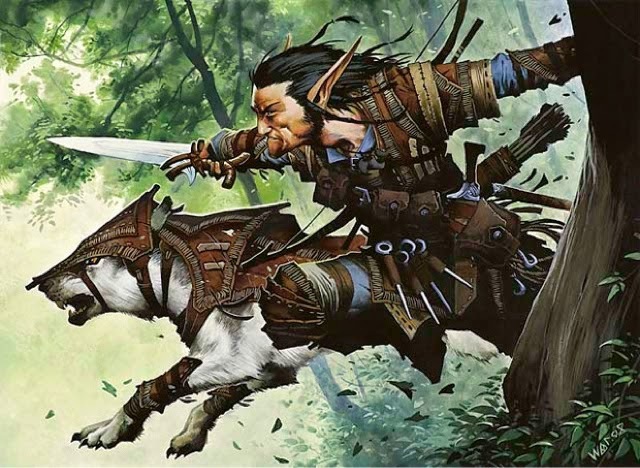 There are many styles of roleplaying, from the traditionally understood tabletop variety, boffer LARPs, and Computer RPGs which seem to get all the attention among non-gamers, but there are plenty of other styles of play that draw a bit of interest because they aren't so easy to pigeonhole. One of the great things about miniature painting is the fact that it's a modular hobby. That's one of the things that has kept Games Workshop in business for decades, and numerous other companies over the years. The Reaper Bones "Vampire Level" Kickstarter set had a great assortment of all different figures, including high-tech sci-fi figures, fantasy stuff, creatures, and plenty of figures that I wouldn't normally have a use for. A notable one of these looks like a "Warforged", I can't think of any games I play that use characters like this, and it vaguely looks like it could work in a sci-fi setting. Perhaps after watching "The Wolverine" recently, I've been inclined to paint a robot with a flaming sword. I figured that the team I've painted up could do with a heavy infantry, so this "warforged" could work as a heavy cyborg for the team. 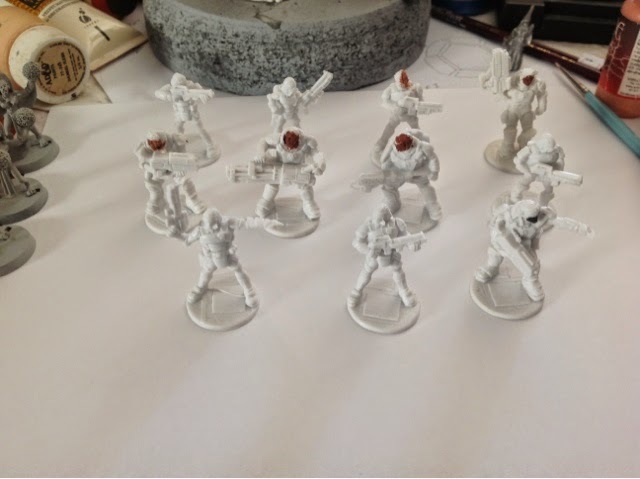 It is time to get to the individual detailing on figures. By this stage, I've added in the eyes where they are exposed, I've done a few degrees of drybrushing on the bases, and I've started shading hair. I realised at this point of the process that a few of the weapons are common across multiple figures, but I didn't necessarily paint them up the same way with the earth brown undercoat colour. To bring these weapons back into line, I've made sure that their shading effects are similar. I'd like to think that the weapons now look like different degrees of maintenance have been undertaken by their respective holders. But the real detailing is elsewhere. I apologise for the quality of these illustrations, I'm playing with a new sketching program on my iPad and it feels like finger painting. This sequence of sketches is basically designed to show the way I paint eyes on figures, it's a technique I learned from a few painters many years ago, gradually refining it into my own style. Let's start with the basic figure face. 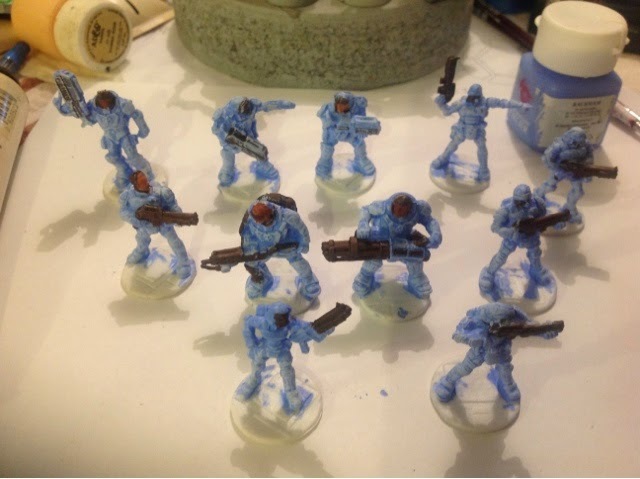 The problem with fine detail on figures is that you often need to create minute elements that are smaller than a single drop of paint on the end of a brush tip. There are ways around this. The first thing I do is to apply a white dot over the entire area of the eye. It doesn't matter if this dot is bigger than the final eye (in fact it's probably good if this dot is too big). If i'm doing something more exotic (like a cat's eye), I might colour this sclera in yellow, red, or some other shade. One of my favourite techniques for getting a metallic effect on metal figures is to just go with the medium. I just take a sharp hobby knife and scrape back the paint and primer until a bare metal surface shows...nothing looks more metallic than raw metal. But these figures aren't metal, so that technique can't be used at all. I need a different way to bring highlights and contrast to the parts that I want to look metallic. Now that I've reached a point that I'm satisfied with for the armour, it's time to play with the secondary colour that dominates the weapons and provides accents to the existing armour pieces. Using the same ideas behind the armour, I have begun with a dark shade (brown earth), and now I mix in shades of a copper metallic paint. Heavy drybrushing ensures all of the weapons are coated in this shade except for the deepest crevices and shadows. 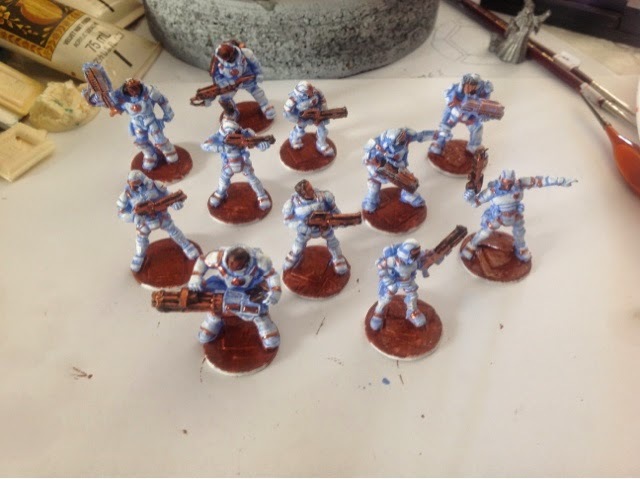 A second, lighter drybrush is done with the straight metallic copper colour, and while I'm playing with the straight copper I add some bands across the figures' boots, wrists, elbows, and outline certain panels on the armour. This pulls the weapons and armour into a closer synergy. The various parts of the figure feel like a whole, rather than disparate elements. All eleven figures have now had their armour finished. Well, finished is probably not the best word, but this stage of the process is over. I'll come back to add some details and flourishes later, but the basic colouring is done. As a group, they seem pretty coherent at this stage, so I'm on the right track. Later I might be adding some features to make them more individual, but not too much. We need to keep in mind that this group is a single team. When I paint figures, I like to build up depth through a couple of layers. 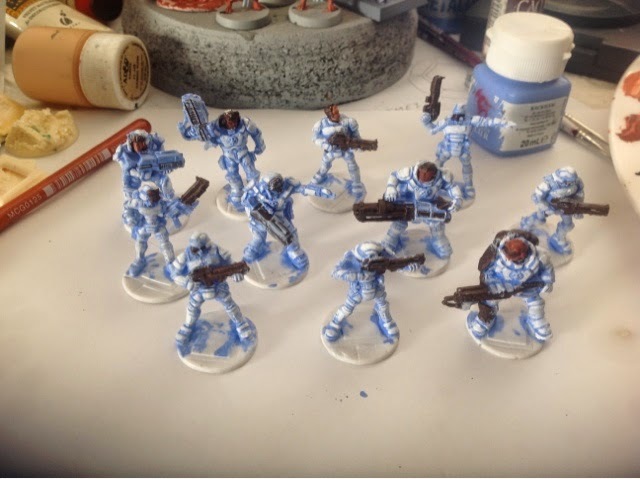 In some cases, that might be starting with a colour approximately what I'm after, then shading the crevices darker with thinned paint or ink that sinks into all of the cracks and details, then applying a highlight layer through a technique like drybrushing. In some cases it might be starting with the darkest shadow tone, then gradually building up layers of lighter colour with progressive stages of drybrushing. The latter technique is what I've done here. 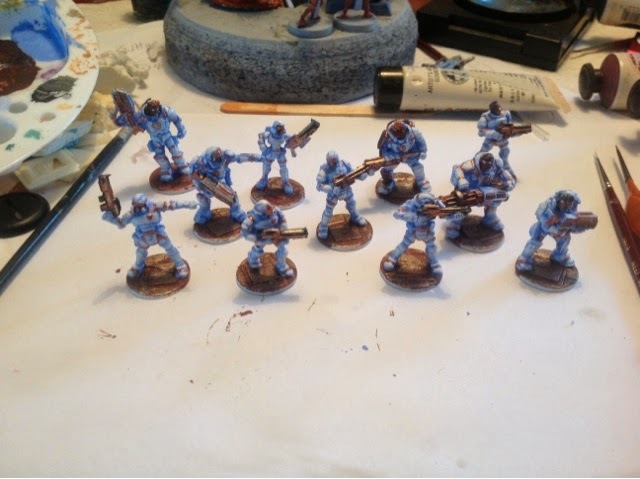 Why did I only use two base colours for the figures (one for the armour and one for the metals)? It just something I do to make sure a figure doesn't get to busy with different colours. I'll add in other colours when detailing comes up later in the process, but for the core colouring I'll stick to a single colour and some kind of accent colour. If I use a third colour, I'll use the old 60-30-10 ratio that is common to industrial and interior design (that's probably an old habit from years of university training and study)...60% of the figure painted with a dominant shade, 30% of the figure painted with a secondary feature colour, and 10% painted in either of these shades (giving a 60-40 or 70-30 ratio) or using that final 10% to create an accent colour (perhaps depicting a figure's rank or something special about them). I had an art teacher who once stated that the painting doesn't really begin until you've laid down the first batch of colours and fully covered the canvas with pigments that will underlay the final work. This bit of the procedure is basically the final bit of prep work before the "proper" painting can begin. In the case of these miniatures, I painted everything I intended to be metallic with a dark earthy brown colour. The thought process going through my head here was to indicate that even though the armour is clean and pristine, the weapons see a lot of use, they are regularly oiled and maintained. I also like my metallic shades to be something more than a straight silver or gold...perhaps indicating alien forging technologies, or alloys that just aren't seen here on Earth...so I give them base coats of reds, greens, blues and other shades to make them a bit interesting. 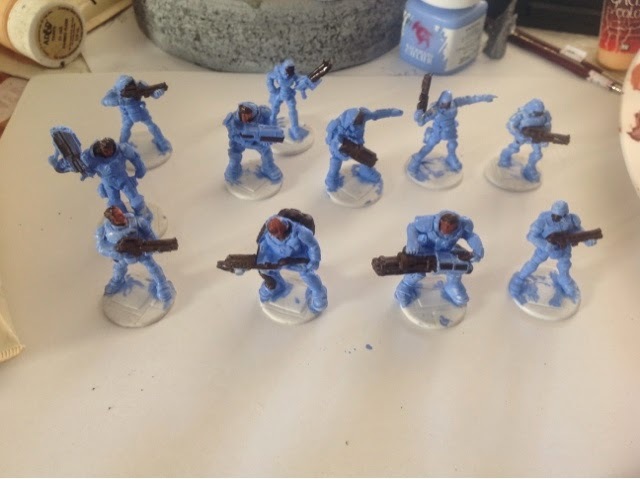 One of the keys to painting good figures is laying a good base coat of colour. This gives a foundation to build up detail and really make the figures something special. Normally with a metal figure I'd use a good primer. Traditionally many painters use a black primer for dark figures and a white primer for light or vibrantly coloured figures. I've even seen a fascinating technique where figures are sprayed with black primer from below, and white primer from above to give a built in shadow effect. My laptop is dead. After a thorough cleaning, half of the keys still don't work on it and now it goes through an endless cycle of rebooting, staying active for a minute or two and then rebooting again. I'll hopefully be able to rescue the hard drive with notes for dozens of unfinished games, hundreds of illustrations, and all the other stuff one might normally have on a general use computer. So, while I work on getting a new replacement, the blog will take a detour. I'll be focusing on something that can be handled purely with the iPad that has temporarily become my primary computer. Hopefully I'll get back to the geomorph tutorials soon. 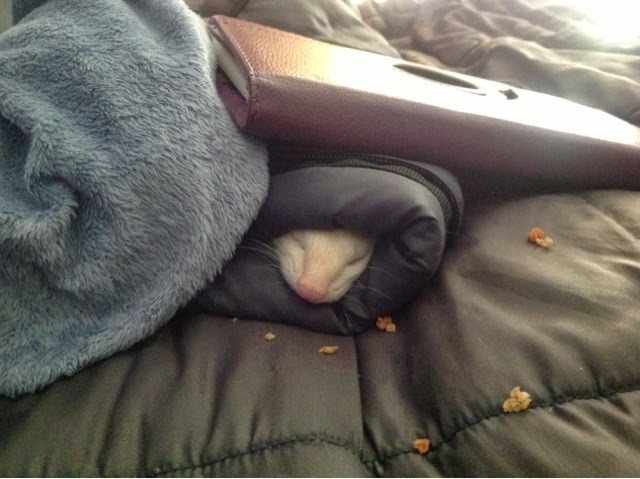 There are a few important things to remember when you have pet ferrets. One of these is to be careful where you walk, and another is to avoid leaving valuable things in easily accessible locations. I'm typing this up from my iPad at the moment, because the laptop was in an easily accessible location on the floor of the bedroom. 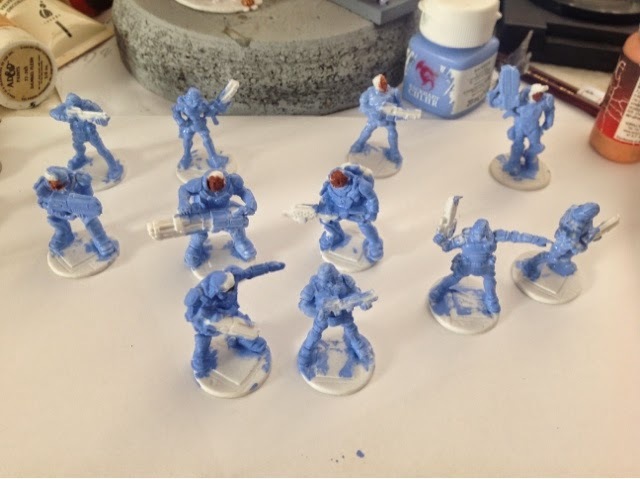 After spending a few hours yesterday painting some miniatures, I returned to the bedroom to find a neatly deposited pile of ferret poop just above the keyboard. I couldn't see the typically accompanying yellow pool of liquid, but after cleaning off the poop my keyboard will not type half of it's letters (mostly concentrated near the poop, but random letters across the entire keyboard seem to be affected). This means that our regularly scheduled geomorph series will have to wait for a thorough keyboard drying, cleaning and reassembly...hopefully the laptop isn't completely FUBAR. 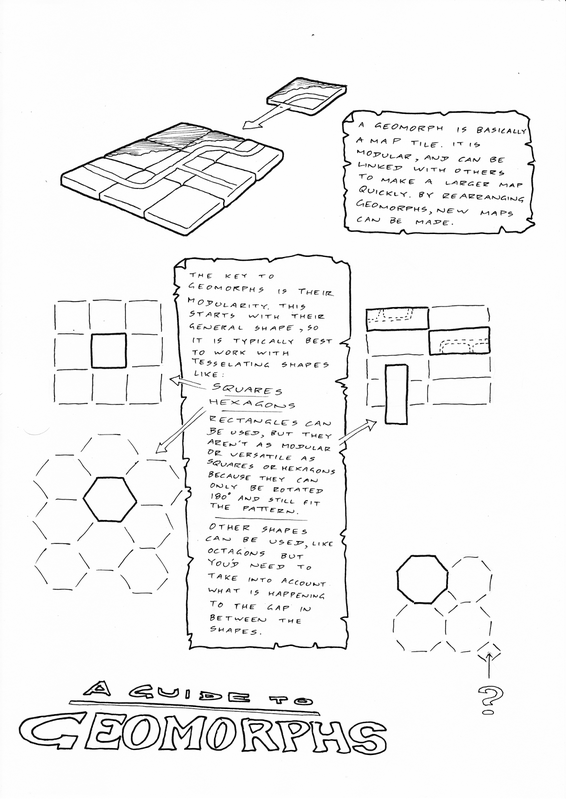 2 pages today, exploring the potential combinations of geomorph sides when using a square or hexagonal base. 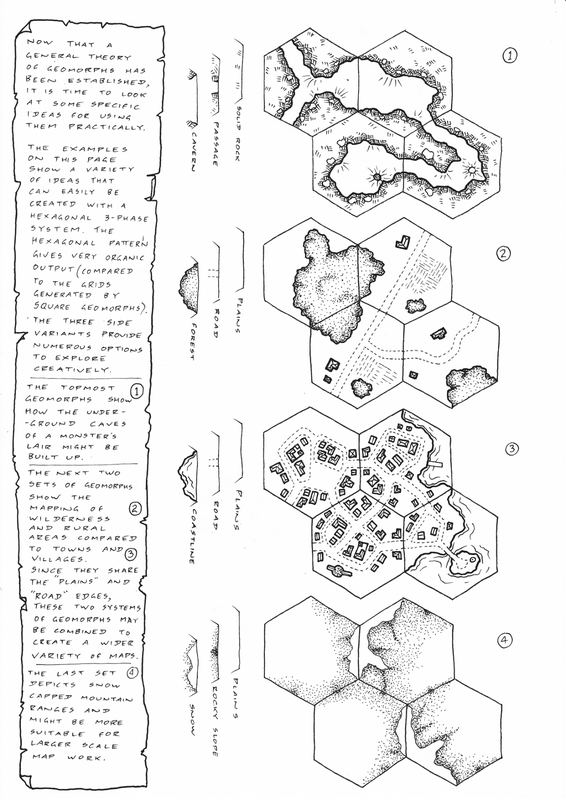 More options are available when using hexagons; this may mean more work is necessary to get the basic structure of the system working, but it also means that there is more scope for custom geomorphs once the core set has been worked out. Good geomorphs are all about preparation, so there are going to be a few more theory posts before we get stuck into the drawing tutorials. I hope you're finding these interesting; if not, bear with me for a couple more posts and then we'll get to the fun stuff. 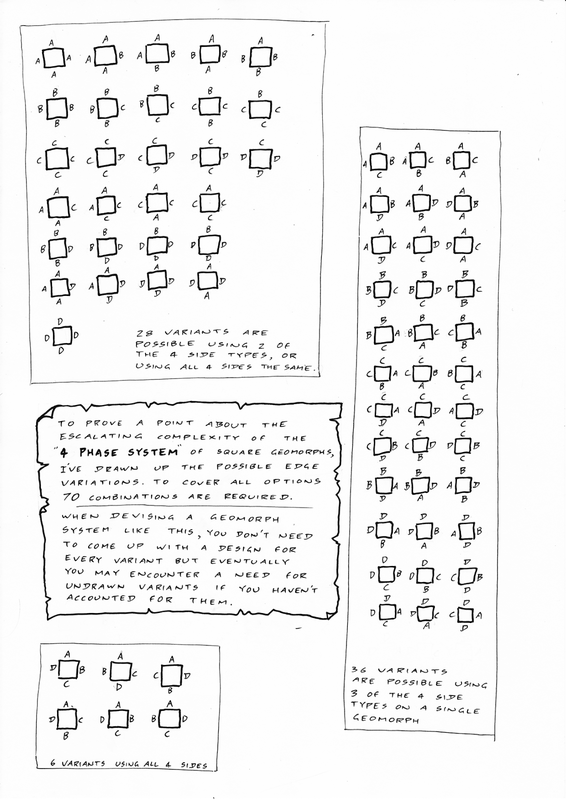 A bit more theory, this time focussed on the game "Carcassonne", which lays out tiles that are essentially geomorphs that build up a map through the course of play. A few more posts like these and we'll be ready to start designing geomorphs of our own. After numerous requests to get back to map tutorials, it's time to start our new series. This time focusing on the concept of geomorphs, modular map fragments that can be mixed and matched. We'll start with a couple of theoretical tutorials before sinking into a few more practical posts. I'm predicting a dozen or so posts in this sequence, but let's see how long it lasts. I've been working on a series of city geomorphs. 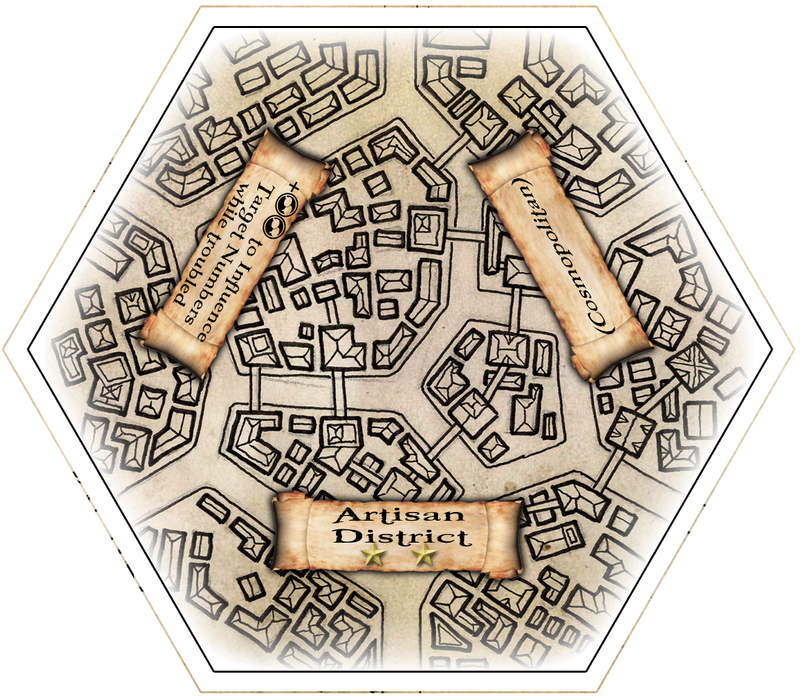 The last set I developed was for the "Town Guard" boardgame. These new ones depict a modern/cyberpunk/sci-fi city. So that gives me an idea for a new series of posts describing how I create geomorphs like these. The key to this sort of thing is preparation. If you're wondering what I'm talking about, geomorphs are modular map fragments that can be pieced together to create a wide variety of map designs. They may not do everything, but since they can be rotated, shifted and generally connected in different ways, they provide versatility and can be used multiple times without getting boring.